Ensures perfectly aligned holes every time. Simple and effective tool that is easy to use. Perfect for 90 degree drilling of clean holes. Simple design that solved the problem that was challenging me. This is a great product to use with the long shank forstner bit. Haven't found a similar product. This works great , I have used one many times. Always does a good job. I bought the jig guide & the 3/4" long shank Forstner bit to drill holes in my laminated, maple workbench (also from Rockler), for holdfasts. The workbench is 1 3/4" thick, and the bit (as I used it) cut to only an 1 1/2" or so. I was able to finish the holes by removing the guide and centering the bit in the hole, eyeballing it, and waiting for the drop. The maple is tough (for an old guy) and I had to take it slow for the 22 holes I drilled. Keep the bit clean as you go. I marveled at how well the bit and guide held up. I don't know whether 4 or 5 stars are deserved. The maple seemed to vary in hardness. I bought this jig with apprehension as no one at the store, at the time I was there actually had experience with it. But I really wanted to drill some dog holes in a workbench I am building so I bought it. I tried it several times on waste lumber with no problem. Then I drilled 16 dog holes in a hard maple butcher block top 1-3/4" thick. It worked perfectly. Excellent product. Needed extra long shanks to drill in candles. Bits are of excellent quality. A Forstner bit is a Forstner bit. What can you say except it works. What is really outstanding is the delivery time - ordered on the 15th and arrived on the 19th. Way to go Rockler. Keep using USPS for small stuff, it's much faster. Just used the 3/4 inch carbide forstner bit I bought for boring spoke holes in headboard and footboard I'm making. So far 54 of the 108 holes are complete and I can highly recommend this bit over other forstner bits I've had experience with. Chip extraction is great and even though I'm boring in cherry there has been no sign of burning. No question I'd buy these again. Had to drill a hole through an 8&quot;x4&quot;x4&quot; block of wood (the long way) on my bench-top drill press. In order to do that, I had to drill from both ends with the extender attached. It worked beautifully with a clean hole that met almost perfectly in the middle. Highly recommended. Carbide tips mean less time sharpening compared to traditional HSS bits. Less time sharpening means more time working, less wear, longer bit life. Seriously, if you're buying bits (drill, router, saw) get a quality product and enjoy working like a pro.the jig is great when you can't take the piece to the press. I added a 3/8" nylon washer between the stop collar on the bit and the jig. reduces wear, heat, and maintains speed. This is an excellent product. You get what you pay for, and these is worth every cent of it. my first bit dulled after about 20 hinges. Can still get it to work some on a drill press but will not work with a hand held drill. The forstner is a custom item; may as well order from Rockler, will be hard to find anywhere else. So buy an extra now before you need it or buy a sharpener for forstner bits. Great for 4 holes or so. Once it's set up oddly properly it works ok in a pinch. This is not something you'll want to use repeatedly. I think it's pretty simple to use it's conveint and portable you won't go wrong using the set up. The device cuts a nice hole but was not long enough to use the bit and jig both to go through the workbench top. The bit needs to be a couple of inches longer. I do not mind evacuating the chips several times but it is hard to keep a straight hole for us old people who might shake a little. Otherwise a good product. This works very well, but you really must have the bottom flush with the wood to make it go in straight. I have since acquired a drill press, but still use this of and on. It is set up for one size shank. There are times you just cannot use a drill press. This device works better than it has a right to. I have used it to guide very deep 3/8&quot; holes as well as with Forstner bits. Very pleased. I am still reserving judgement as to how long it will hold up. I do my best to avoid letting the drill bit flutes contact the pilot hole to minimize wear. I'm a one man cabinet shop and I've used this jig for more than a few years now and I actually like it. You can pay a lot more money for similar devises, but for the money this jig works pretty well. Works very well with the Jig-It system I got for making/mounting cabinet doors in our new kitchen. I would give it a &quot;5&quot; if I could easily get the same thing elsewhere. Other &quot;long&quot; shank bits are not the same shaft dia. for the whole length. So, while the JigIt system was great, I can't get the bit locally if I'm in a pinch. Haven't used the drill guide yet, but I have used the Forstner bit in my drill press. The bit cuts like it is butter. I will certainly purchase more of the bits. I wanted to drill forty four 3/4&quot; holes for dogs in my woodworking bench and wanted them to be straight and perpendicular to the tabletop. I attempted other jigs to do this job, but none were satisfactory for me. This jig, along with the 3/4&quot; long shank carbide Forstner bit worked excellent for me. I am drilling through 2 inches of hardwood and the carbide really helped. Very good product. This drill guide helps me stabilize the drill bit for a more accurate outcome. Lack of drill press means too much eyeballing. This jig helped very much to keep my forstner bit straight with my hand drill. This simple device is solid and a great idea. The price is nice too. The drawback is that it apparently only works if you also purchase the Rockler long shank drill bits. Otherwise it is not very useful. The long shank Forster bits cost over $40 each. Ouch! The guide looks like it will work well but I was told by the online chat it would work with the bits I was also buying (Individual Standard Forstner Bits). That is incorrect. the guide will fit on the shank the gets chucked up but will not go down where it would need to be. It can only be used on very specific bits. Know befor you buy and ask for a copy of any chats you have so you can prove what you're told. This functions fairly well but has one flaw that should be corrected. Since it is made entirely of a composite material, after I used it to cut many holes in walnut and ash the shaft of the drill bit became hot and actually melted the device causing it to stick to the drill shaft! I eventually solved the problem by lubricating the drill shaft, but this really needs a brass bushing thru which the drill bit would be inserted. I was drilling holes and it was adequate for my purpose. Were I able to clamp it appropriately, it would have been very accurate. Bought this bit to work with the Rockler Jig It guide. I was working next to someone with a different guide and a box store bit same drill and they were drilling holes at a pace of 1.5 to my 1 hole. We were drilling about 2,400 holes and the other guys lasted much longer and was effortless the entire time as mine needed some help getting the job done. Does not work with a 3/8" shank forstner bit,I believe that it is supposed to,what the heck. Not what I thought ir would be. Disappointed. It’s made of plastic and the bore is too small to be useful . 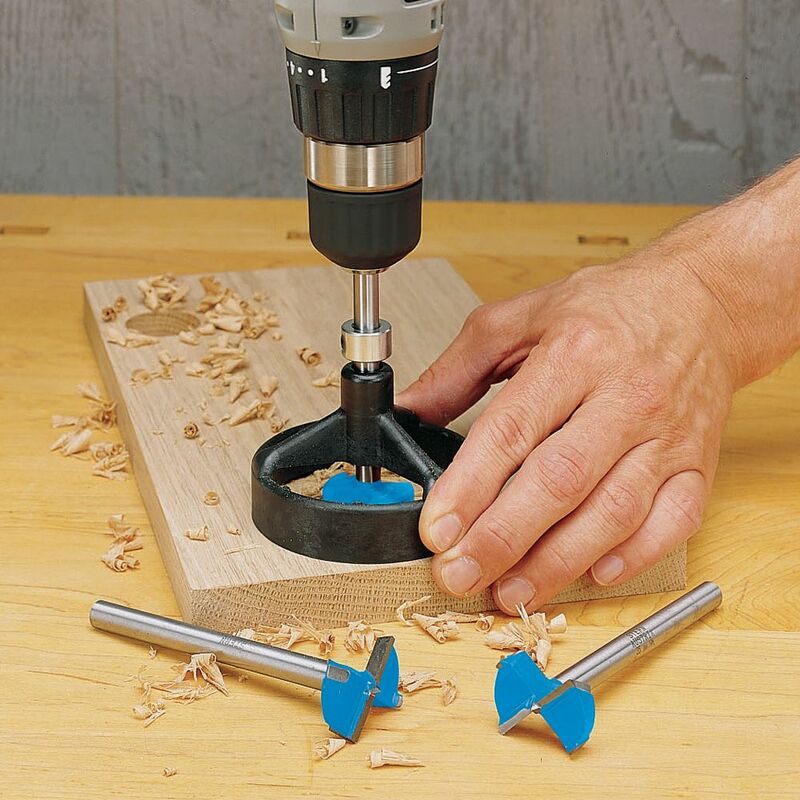 That is, your bit probably won’t reach the wood surface because the bore tip will carch the drill and stop you from pushing down. I bought it to help with Forstner bits mostly, but unless I drill out that bore and open it up, possibly ruining it, it’s pretty useless to me. the guide only works with one of the bits. I had to drill the guide to use the bit I wanted to use. did not work for me . opening too small for standard Forstner bits. When tried to drill larger opening, casting broke. I am going to return this product. It's for Forrester (sp) bits only. I didn't realize this when I bought it. The jig worked fine, but the long shanks 35mm bit was dull after three holes in oak. Needed a guide until I can afford a drill press. Price. Need it to drill a series of holes in my workbench. To make straight holes on pieces that I can't get on my drill press. To drill quality 3/4" holes on work bench, this seems the right tool for it. Additional control for specific projects. Looks like what I need for a project. I had not seen an item like this before. I think it will be valuable to make more accurate drilling. Drill straight holes with hand drill. Looked for ideas on Internet and this seemed best for my use. Perfect for drilling straight bench dog holes in my work bench. Not having a bench press, this was a sure way to get it straight up and down. Tired of holes not going in at 90 degrees. The best that I've seen. Tabletop too big for the drill press. I have purchased two of the traditional style drill guides, and can rarely get a consistent right angle. The traditional style ones are designed to support a wide range of angles, but I only need 90, so I'm giving this one a try! replacing hinges and need to have depth control. Nice straight grid for my sanding and assembly table! I have a chopped down drill press that I use to drill perfectly flat recesses for plaques and such on the tops of tables. I looked all over for something like this, and Rockler has had it for years, I guess. I wish there was an easier way to find stuff like this on their website. Easy way to drill perpendicular holes when there is no access for drill press. I am a guy who can't drill a straight hole with a drill press.. So there you go !.. Drilling holes in log furniture that I make. You have to eye-ball when drilling and this should help with un-flat logs. My Maple work bench is 28" deep and 84" wide by 4" thick so I cannot use my drill press. It does a good job at drilling accurate perpendicular holes. for use with fostner bit to drill holes in my pool table rails. I want to drill a series of holes for dowels. The dowel outcome must be parallel, plumb and level, projecting out handsomely like the big guns on a battleship, not sticking out every which way like I tried only to eyeball it. Will this set up drill a 3/4 inch hole through a 4 inch thick work bench using the Rockler Forstner bit? Will these bits fit in a JIG IT drill guide? I'm looking for a 20mm Forstner but there's no 20mm long shank bit. I have specialty bits I need to use ranging from 3/8" to 1/2" diameter. Will my bits work on your guide? BEST ANSWER: the bits designed and sold as a system feature extra length, and a common diameter shank to fit the guide bushing. you will need to determine if your existing bits match the necessary common shank diameter, as well as sufficient travel length. Does this jig come with a bit? A lot of the reviews talk about the bits. No, it does not come with any bits. 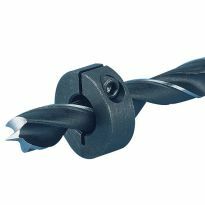 can I drill a 25 degree angle? BEST ANSWER: No you can not. It can only do 90 degree holes. I do not recommend this item because it can only accommodate a few bit. I recommend buying a drill press or a drill mod so that a hand held drill can be used as a drill press. No. 90 degrees. You need a drill press with an adjustable table for that. No. It is 90 degree only. how deep can you drill with this jig? BEST ANSWER: Technically you can drill as deep as the length of the bit minus the height of the jig itself and the length of bit needed to be secured in the chuck. I used the jig to drill cups for hinges and only needed about 11mm but if you remove the spring and the collar you could probably plunge the thing 3 or 4 inches with the standard Rockler Forstner bit. Having read the other reviews I am not sure why Nicholas B encountered those problems, I didn't encounter anything like that. I was able to drill approx. 3 in. Not sure if I could have gone deeper. Can Forstner bit extender be used with Rockler drill guide? Or are long-shank bits required? BEST ANSWER: A long shank bit, such as Rockler item 10117, is required with this jig. Can I use this jig with a regular straight bit and can that bit be 8" long and still get plumb? BEST ANSWER: Yes and no. It will have to be a 3/8" shank bit and the top of the tool will be about 2-1/4" above the work piece. You will have to hold the tool steady. AS long as it is 3/8"
BEST ANSWER: The diameter is 3.5". How deep a hole can be made with this jig and bit? Will it drill through a 4 x 4? I want to drill holes through the center of wine corks. I think this will work if I use the forstner bit to drill a hole in a piece of wood that the cork will sit into while I drill, using the the guide, I drill through the cork. My only question... I need a small...(.5 cm) hole actually drilled through the cork. Will the guide accommodate a small drill bit?